Fame: World's tallest office buildings. Where can I learn about the Petronas Towers? View the general location of the Petronas Towers on a Google map. - The Petronas Twin Towers earned the much-coveted "Tallest Office Building(s) in the World" title in 1996, when they eclipsed the previous record-holder, the Sears Tower in Chicago, Illinois, USA. - Number of storeys: 88. - Overall height: 451.9 metres from street level. - Height of superstructure (without pinnacle): 378 metres. - Tip of longest pile to tip of pinnacle mast: 592.4 metres. - Location of Skybridge: Levels 41 and 42. Fame: World's largest indoor ski area*. Where can I learn about the SSAWS Ski Dome? View the old SSAWS Ski Dome location on a Google map (large diagonal rectangle). Fame: World's longest suspension bridge. 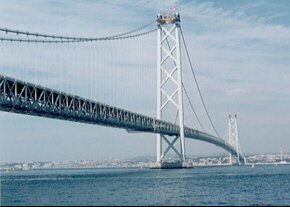 Where can I learn about the Akashi Kaikyo Bridge? Fame: World's first airport built entirely on reclaimed land. Where can I learn about Kansai International Airport? 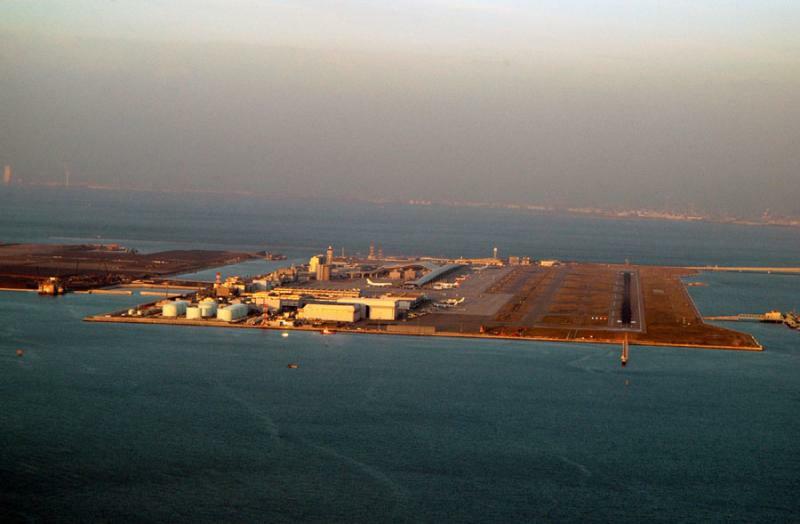 View Kansai International Airport on a Google map. Location: Sandouping, Yichang, Hubei, China. Fame: World's largest hydroelectric dam. - Reservoir Capacity: 2 billion cubic metres. - Power Generation Capacity: 18.2 million kilowatts (26 x 700MW generators). - Construction Period: 1993 to 2009. - Expected Cost: US$24.65 Billion. 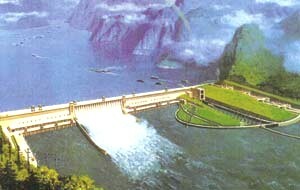 Where can I learn about the 3 Gorges Dam? View the Millennium Dome on a Google map. - Length of Skybridge: 58.4 metres. - Height of Skybridge: 170 metres from street level. - Vertical transportation: 29 Double-deck high speed passenger lifts in each tower. - Number of escalators: 10 in each tower. - Stainless steel cladding: 77,000 square metres. - Vision glass: 65,000 square metres. - Concrete (various strengths up to grade 80): 160,000 cubic metres in the superstructure. - Steel: 36,910 tonnes of beam, trusses and reinforcement. - Foundation: 4.5 metre (15 feet) thick raft containing 13,200 cubic metres of grade 60 concrete, weighing approximately 32,550 tonnes under each tower, supported by 104 barrette piles from 60 to 115 metres in length. - Height: 296m (70 floors). - Total Floor Space: 392,791m^2. - Hotel floors: 49-70 (603 guest rooms). - Observation floor: "Sky-garden" on the 69th floor. Fame: Japan's tallest office building. Where can I learn about the Yokohama Landmark Tower? View the general location of the Yokohama Landmark Tower on a Google map. - Ski Runs: 2. Lifts: 2. - Other Information: Earthquake-proof, built on reclaimed land. - Completion: Summer, 1993. *Closed: 2001. Demolished: 2004. - Type: Gravity-anchored Suspension Bridge. - Other Information: Each tower contains tuned mass dampers to minimize vibrations. View the 3 Gorges Dam on a Google map. View the Asahi Kaikyo Bridge on a Google map. Photo Credit/More Information: Honshu Shikoku Bridge Authority Web Site. Fame: World's tallest building (as at 2004). - Height: 509m (1671 ft.). - An 800-ton tuned mass damper system is located in an exposed spherical structure near the top of the building, between the restaurant level and the observation deck. - Taipei 101 is the first and currently only building in the world that breaks the half-kilometer mark in height. - Holds 3 of the World's Tallest Building titles: Tallest to structural top, Tallest to roof and Highest occupied floor. - The world's two fastest double-decker elevators, which run at a top speed of 1,010 meters per minute (63 km/h or 37.5 mph), take visitors from the main floor to the observatory on the 89th floor in under 39 seconds. - Construction: Started: 1999, Finished: 2004. Where can I learn about Taipei 101? View Taipei 101 on a Google map. View Taipei 101 with Google Earth. (Right-click to save .KML file). Photo Credit: Patrick Beckers: Skyscraper Picture Collection. Fame: World's largest steel structure. - Total land surface: 258,000 square metres. - Seating: Post-Olympics: 80,000 (11,000 temporary seats were added for the duration of the games). - 110,000 tons of steel were used in its construction. All steel was manufactured in China. - Volume: 3,000,000 cubic metres. - Height: 69.2metres above field level. - The stadium actually consists of two concentric structures separated by a 15-metre gap. The external 'nest' comprises the stadium's frame. The internal concrete seating bowl resides inside the frame. - Width: 294 metres from west to east. - Length: 333 metres from north to south. - Construction: Broke ground: December 24, 2003; Opened: June 28, 2008. 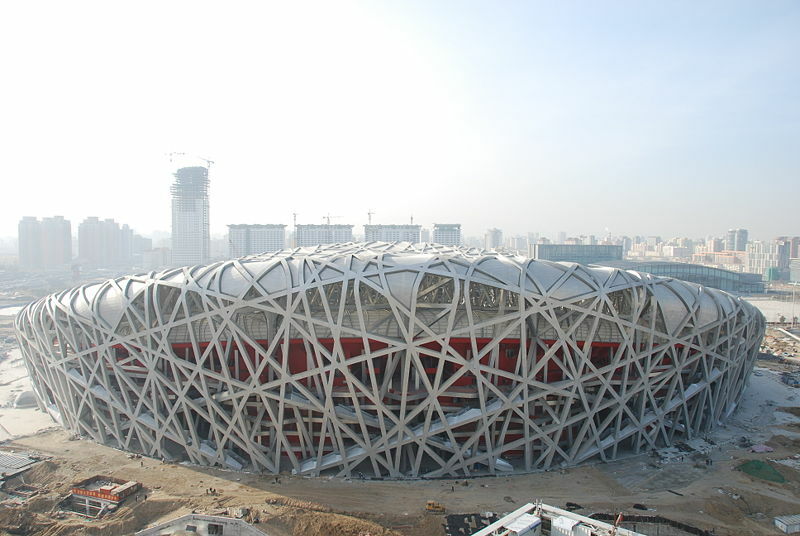 Where can I learn about Beijing National Stadium? View Beijing National Stadium on a Google map. View Beijimg National Stadium with Google Earth. (Right-click to save .KML file). Photo Credit: Beast from the Bush, Netherlands Wikipedia.